Review: This so called "deluxe" DVD set was released to celebrate the 50 anniversary of rock-n-roll along with 68 Comeback special deluxe edition DVD. Finally we have the complete rehearsal and TV Aloha show in complete form in DVD quality. Moreover, the producers re-edited the shows and remastered sound and picture. And I can't say they have not succeed. 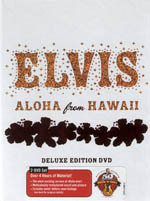 The previous DVD releases of the Aloha shows was missing a couple of songs. A very nice addition to DVD 1 is uncut footage of Elvis arriving by the helicopter. This part is 18 minutes long and lets us see that there were not to many Elvis fans on arrival as it may appear when you watch the edited version. The only interesting part from DVD 2 is post-concert "insert" songs. They circulated on video tape in average quality, but now they are in best picture even possible. This part was filmed after 12-30 AM show on January 14. Elvis jokes, although he seems very tired after the show. The only minus of this DVD is that the producers had not included the publicity material from the previous year. I mean 1972 November press-conference and other stuff, which was also captured on camera. Hopefully somewhen we will get another "deluxe" release this time with the promoting 1972 stuff.